This week a Gallup poll came out which showed that for the first time, a majority of Americans favor legalizing marijuana. 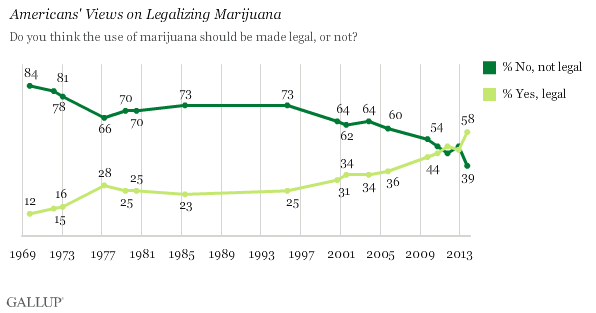 In fact, in the past year, the support for marijuana legalization surged from 48% to 58% of those polled. Here in Colorado, we live in a state that has had medical marijuana legal for years and which voted last November to legalize its recreational use as well. Not to mention that here in Boulder County, whether it’s legal or not, people in this area have been smoking a lot of pot for a long time and will continue to do so. A friend of mine who just moved to BoCo wrote this about how prevalent marijuana use is just in his daily commute. Just the other day I was talking to someone about Lyons High School (thinking ahead for our kids); they said it’s a good school – but that it’s known for the kids there smoking a ton of weed. Marijuana is here to stay. It’s already been legalized in this state, and will soon be regulated. Interestingly enough though, I have heard almost NOTHING from Christian leaders on this topic. I have, however, heard a lot of people talking about it – including Christians, saying things like: If marijuana becomes legal and readily available in the same way that alcohol is, then is there anything wrong with trying it out? If you can buy it in a shop and it becomes socially acceptable, then is there any reason to not occasionally indulge? Up until now, pastors have been telling people they shouldn’t smoke pot because it’s illegal, and the Bible instructs us to honor the laws of the land we live in (Romans 13). But now – guess what: game changer! Marijuana is no longer illegal! Drinking alcohol in moderation is more or less acceptable in most Christian circles these days – so if marijuana gets put in the same legal category, then is it okay to treat it the same way? These are real questions that people – including Christians – are considering. If Christian leaders aren’t talking about what people are actually thinking about and talking about, then we have become irrelevant and are not engaging people and bringing God’s word to bear on the time and place we live in, as we are called to do. So, what should be the Christian response to the legalization of marijuana? The Bible doesn’t say anything about marijuana – just like it doesn’t say anything about tobacco or chemical weapons or genetically modified food. But there are principles the Bible lays down which apply. The “don’t do it because it’s illegal” argument is soon to be off the table, so what should our position be towards recreational marijuana use? The Bible doesn’t say anything about marijuana in particular, but it does speak about mind-altering drugs – in Greek: farmakeia – which were used recreationally rather than medicinally. Also, the Bible tells us not to be drunk, but to be filled with the Holy Spirit – i.e. : Don’t be under the influence of substances, but be under the influence of God’s Spirit. More and more people are speaking up about how much safer marijuana is than alcohol. You never hear about people committing violent acts because they are stoned. Marijuana has also not been shown to cause long-term brain damage as alcohol has. But the difference between marijuana and alcohol are that you can drink alcohol without getting intoxicated. It’s possible to drink wine (like Jesus did) or beer with a meal to enjoy the flavor without getting drunk. No one smokes marijuana just for the flavor – the very point of smoking it is mood alteration. Will marijuana legalization change anything? It’s clear by now that adults are going to smoke marijuana whether it is legal or not – which is why more and more people are saying, ‘why not tax it and regulate it then?’. It has been estimated that up to $40 million dollars in tax revenue could come in from recreational marijuana sales in Colorado, which would be earmarked for schools. Regulating marijuana, they point out, could also kill at least part of the black market for it, which inevitably leads to violent crime. Certainly marijuana use would increase once it’s legalized – as people who were once worried about doing something illegal would no longer have to worry about that. Also, and this is a concern for me – it would make it more accessible to kids, because they would no longer need to find a dealer, they will just have to find a friend with an older brother who is willing to buy it for them – just like with alcohol and tobacco. I smoked pot when I was a teenager, before I gave my life to the Lord when I was 16. I have family members who smoke pot regularly, and I don’t want my kids to smoke pot. I don’t want them to check out or get intoxicated to cope with life or to have fun – whether with alcohol or marijuana or any other substance. There are plenty of things the Bible instructs us not to do that are legal in our society, such as adultery, fornication, drunkenness, sorcery, etc. Christian maturity means being able to discern and choose for yourself, from a heart-felt response to God’s grace rather than needing to have someone hold your hand and dictate to you what to do. There are plenty of ways to harm yourself which are completely legal. You can go buy some glue and sniff it and get high – legally. There are also ways to harm yourself, however, which are illegal, such as chemical food additives, cocaine, certain medications, meth, etc. which we consider detrimental to society and harmful to people, which we have banned and we don’t give people legal avenues to indulge in. For us as Christians, the point is clear: marijuana is intoxicating. We should not be intoxicated or controlled by substances, but by the Holy Spirit. It’s pretty cut and dry. For society in general, it’s a question of whether or not it would be helpful or harmful to have more intoxicated people everywhere and to make a mind-altering drug more accessible to children than it already is. So what about marijuana for medicinal purposes? People take far worse things for cancer and chronic pains, so would be acceptable by God? Does God want people to suffer through the pain, perhaps suffer for their sins? i have a chronic pain in the neck and back, so i could take pain pills, but i abstain from them because i do not want to be addicted to them. i have been torn on the issue of legalising marijuana, but i have seen the war on drugs and it had last longer than any other war that U.S. has become involved in through its short history, although most of United States wars have been about oil, so perhaps it is the second largest war. The war on drugs was and will always be a complete failure, as was prohibition. I think medical marijuana is a more complicated issue than recreational marijuana. Recently Dr. Sanjay Gupta from CNN changed his position on medical marijuana – he had been against it for many years and is now in favor of it. I do have some thoughts on medical marijuana and the medical marijuana industry, but I think I will have to write another blog post to cover that topic alone. As far as the war on drugs, it hasn’t been pretty…and it doesn’t seem to have been very effective. Obviously the answer can’t just simply be the legalization of mind-altering substances though – especially in the case of drugs which are more potent and hazardous than marijuana. Ephesians 5:11 states: Have nothing to do with the fruitless deeds of darkness, but rather expose them. I believe this means to remain true to our faith in Jesus Christ by obeying His Word, even if the majority of people around us do not. The war on drugs is not a war we can win with money and physical force. Ephesians 6:10-18 gives believing Christians instructions in how to do warfare, spiritual warfare. God’s power is far more effective than any of our man made attempts. As for medicinal purposes, the chemicals in the plant may be extracted to be contained in consumable forms such as pills, injections or oils to produce the desired affect. I have been told by medical specialists that it is the most effective drug to treat loss of appetite and nausea especially in the elderly, in cancer patients and those with incurable, fatal illness. I guess the question I’m addressing is whether or not marijuana use is actually a “deed of darkness”, and of so, why? I think that is a question many people are asking these days. I agree that hemp without THC has many positive uses. I too have heard that marijuana can truly help some sick people, and in that case, I think it might be okay to use it as medicine. I agree that it would be better in that case to sell it in pill form to help emphasize the difference between recreational and medical use. Thanks for sharing your opinion! Drop in again soon!